Let’s face it, businesses measure their success on their bottom-line. Many make decisions based on becoming more profitable either immediately, or increasing profits in the future. Tasks such as reducing costs, marketing strategies to sell more products or services, or growing their business into new locations, are all tasks that are linked to increasing the profits of a business. It can be difficult for a business to afford all the benefits it would like to provide for its employees. Especially new businesses who are trying to create a budget for all their expenses as they grow their employee base. Use these tips to help find affordable health insurance benefit solutions for your workforce. There seems to be a stigma attached to HMOs (Health Maintenance Organizations) that makes them seem unfavorable to a lot of people. I’m sure it must do with the fact that it may cause some extra work if you are needing to see a specialist, as you would have to get a referral from your primary physician first, however, that usually isn’t the case anymore. Most HMOs are “open access,” which mean you can go directly to a specialist without a referral. The best part is, HMOs will typically be more cost effective providing your employees are in network areas which are normally larger than past years. Cost savings can be significant for your business. So if you’re looking for more affordable healthcare benefits for your employees, start with looking into an HMO. 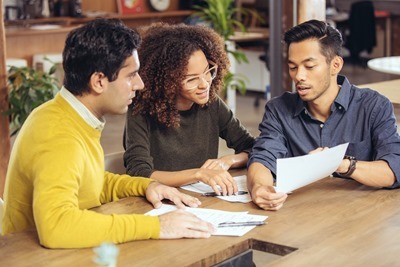 A well-known philosophy of a successful business is to keep your employees feeling “taken care of.” One way to protect them from falling into a financial black hole is by offering a high deductible plan, along with a gap insurance plan. Combining those two plans would give your employees the coverage they need, with less out of pocket. In most cases this will save the business money compared to a plan that has a low deductible. Many businesses want to offer their employees as many benefits as they can in order to help attract and retain good workers. Sometimes it just isn’t in the budget to offer all of the benefits that you would like to. Remember that you are only obligated to pay 50% of your employee’s health insurance premiums on the lowest health plan offered, and 0% of their dependents. Offering an HSA (Health Savings Account) may not be your first choice of healthcare benefits you want to offer your employees, but it can save you money. It also may give your employees some tax advantages. Some small businesses don’t know that they may be eligible for a “tax credit” for offering their workforce health insurance benefits. If you have a group that is below 50 people, contact us by calling the number below to see if you qualify! In today’s insurance market, plans are changing all the time. Whether the carriers are adding new plans, or eliminating old ones, it is crucial that you review your plan periodically to assure that you are still paying a competitive price. MHG Insurance Brokers offer many different insurance solutions for many areas of business. If you are interested in purchasing a disability plan, health insurance, or life insurance, contact us at mhginsurance.com or call us at +1 954 828 1819. Our insurance specialists have the knowledge and experience to assist and guide you to the best coverage for your budget.